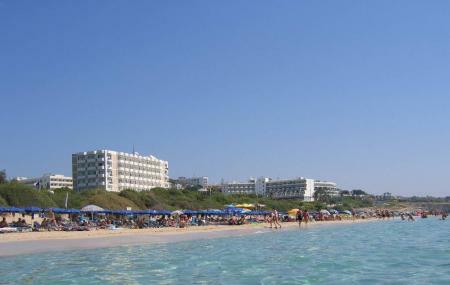 Glyki Nero Beach is a breathtaking sandy beach with clean water located in Ayia Napa municipality. The earned its name because of the water it posses. The term Glyki Nero translates to “sweet water” which completely justifies the Blue flag eco-label the beach was awarded with. The beauty of the beach can easily pass for a little paradise in Ayia Napa. Lifeguards and life saving equipments are available from 10 am to 6 pm only. How popular is Glyki Nero Beach? People normally club together Ayia Napa Sculpture and Harbour Beach while planning their visit to Glyki Nero Beach. Crystal clear water in beautiful blue color. This place is in walking distance to the "love bridge" where you can make some beautiful photos. Also, I recommend you to lunch in the fish taverna above the beach. It has a terrace with unbelievable views and food is good as well. Many tourist boats stops nearby the beach. The best beach around. Not that many people during off peak season. Bellissima spiaggia, appena fuori da Ayia Napa.